A Test: What Kind of Gardener Are You? Please look at the following picture and write down the first thing you see. All done? Put down your paper and pencil and let's see what Dr. Hortfreud has to say about what kind of gardener you are based on what you first saw in the picture. If the first thing you saw was the half eaten tomato, and you wondered how it got there, and you decided that a squirrel probably picked it from a tomato plant in the vegetable garden in broad daylight, then drug it half way across the yard, intent on carrying it up the only sizable tree in the back yard so he could feast upon it for days, but the squirrel realized it was too heavy to carry or something scared him and he dropped it, then you are the kind of gardener who gardens where there are squirrels and you know the trouble they can cause. This is answer a) Squirrely. If the first thing you saw were the toad-lilies with half dried leaves and you wondered why in the world the gardener (that would be ME) didn't water them more but you remembered that there is an Extreme Drought where this garden is (that would be MY garden) so the gardener (that would be ME) couldn't water them more so you were filled with all kinds of sympathy for the gardener (that would be ME) and now you can't get out of your mind that image of half dried leaves, then you are the kind of gardener who has sympathy for all gardeners who garden where there is drought and you yourself might be gardening in a drought, too. This is answer b) Sympathetic. If the first thing you saw was the mulch and you wondered what it was and then mentally went through a list of all the mulches you've seen before to figure out what type of mulch it is and finally decided that it must be a pine bark mulch and thought how nice that it keeps its dark color so well, then you are the kind of gardener who expects to see half eaten tomatoes all over the garden and half-dried leaves from extreme drought but is very interested in the science of mulching. This is answer c) Scientific. Finally, if you just saw a half-eaten tomato, half-dried leaves and a bunch of brown mulch then you are the kind of gardener who is not a gardener at all. This is answer d) Not a gardener at all. d) Not a gardener at all. Or if you saw something completely different than the four choices, please let Dr. Hortfreud know that as well. Thank you. I saw two, a and b. Was there mulch? I'm a combination of a and b. I did not see the mulch. Squirrely and Sympathetic. Didn't pay any attention to the mulch. Squirrely. I first noticed the plant and wondered what it might be. Being from the soggy pacific northwest,I wondered about fungus of some sort. Mulch? There was mulch? Mostly B with some A. My toad lilies do that every summer! After a quick glance I wondered why Roscoea plants were growing in your tomato patch. I guess I don't fit into any garden category. Squirrely. But I also am drawn to the color red, even if it's a half-eaten tomato. a) squirrely...but only because I am battling with squirrels and possum for my tomatoes right now. argggh! Sympathetic; but most of my garden looks dried up like that right now. a) Squirrely. I thought I was being sympathetic because I was thinking of your loss. Definitely b:) Last week when I was writing my Bloom Day post, I checked out the U.S. drought map. I was feeling pretty sorry for myself that we were now in a severe drought till I noticed the circular area around Indy that is in an extreme drought. Yes, I am definitely sympathethic! Like most of the others, a and b, although my eyes were drawn to the bright red tomato the most. 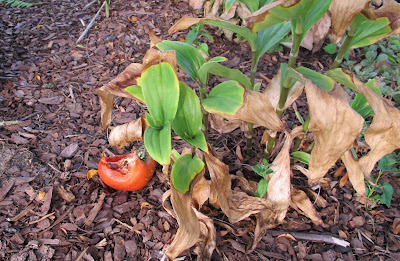 I saw dry leaves, a half eaten tomato, and mulch. I AM a gardener. I'm not a judgmental gardener.